This beautiful and sturdy basket was created for Janis Steele, President of the Meador Homemakers* Club. It's one of those baskets you'll enjoy weaving—just add your own variety of color and materials for the accent rows and you're set with a basket to use or one to give as a gift. 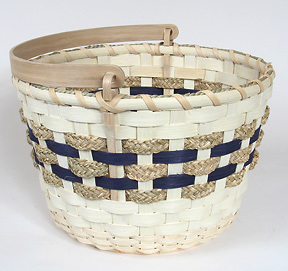 Basket size: 12 in. diameter x 9 in. tall. *The Extension Homemakers organization is part of the University of Kentucky and Kentucky State University off campus information network; it's an informal educational organization designed to help its members gain knowledge and skills to improve the quality of life for themselves, their families and their communities. In Allen County one will find a truly great group of women who join together to learn and share ideas about health, the environment, managing resources, cultural arts (basket making, quilting, etc. ), and other subjects. Make your own Homemakers Basket and celebrate the idea of learning! Calculate Supplies for 1 to 20 Homemakers Baskets with the Basket Supply Calculator. The Supply List gives you the least expensive way to purchase the supplies for your quantity of baskets. View on-line or print to your printer. *This item has been rounded to 1 pound/coil because it is less expensive to purchase 1 pound/coil than to purchase the foot quantity.